Copyright: © 2018 Aldossary AD, et al. This is an open-access article distributed under the terms of the Creative Commons Attribution License, which permits unrestricted use, distribution, and reproduction in any medium, provided the original author and source are credited. Background: In women’s life, there is a period called productivity, which is known as pregnancy. It needs specific and proper care from fertilization to postpartum period. A lot of women undergo some discomforts during their pregnancy time, even though these discomforts are not dangerous, still they can be bothersome. Aim: The present study was conducted to assess the knowledge and practices of primigravida women regarding minor discomforts of pregnancy. Methods: A cross sectional study was conducted at Obstetrics & Gynecology Outpatient Department (antenatal clinic) of Maternity & Children Hospital in Dammam city (MCH), Saudi Arabia from the beginning of March 2017 to the end of April 2017. Total of 82 primigravida women have been undergone in this study, who met the inclusion criteria were included from the previously mentioned setting over a period of two months. Results: The main result suggests that most of the mothers (59%) had good knowledge, 32% had excellent knowledge and only 2% of them had poor knowledge. This study also shows that the overall level of measures practiced by the primigravida women to relief their discomforts during pregnancy were with good practice score (47.0%). Conclusion: Primigrvida women show good level of knowledge scores and also good level of measures practiced by them to relief their discomforts during their pregnancy. However, the current study recommends further research to investigate the unsafe practices related to minor discomforts during pregnancy and its effect on the mother and fetus. Pregnancy is the most beautiful and pleasing event in women's life. During this period, a lot of physiological changes may occur as an adaptation for pregnancy. These changes are necessary to support the function of the maternal, placental and fetal unit [1-3]. Experiences to these changes are varied among the pregnant women. Because of the common minor discomforts from the physiological changes of pregnancy and this physiological changes may had result in feeling uncomfortable, feeling of being overwhelmed or anxious. These discomforts are varied according to trimester, and it can be presented throughout pregnancy [2-4]. Most of minor discomforts during pregnancy are due to normal physiological changes. Minor discomforts can be managed by proper explanation, simple remedies and lifestyle pattern modification. As the pregnancy progress most of these discomforts are relived. Pregnant women could be affected by these minor discomforts. The impact of minor discomforts during pregnancy has been examined; a study shows that women who experience the multiple discomforts longer than a few weeks, their health and well-being will be compromised in early to mid-pregnancy. Such as nausea and vomiting, those are accounted for 43.1% of hospital admissions [5-7]. Consequently, pregnant women should have basic knowledge on common minor discomforts and also they should have knowledge on how to manage these discomforts during pregnancy. So that they can avoid the complications related to their minor discomforts of pregnancy and they can maintain their health condition. One study in India shows that 87% of antenatal women have inadequate level of knowledge about minor discomforts of pregnancy and 65% of them had inadequate knowledge regarding its management [8,9]. A study shows that there is a high rate of women who are using herbal medicine to alleviate the discomforts during their pregnancy. They think that herbs are natural, not harmful and free of adverse effects. But using some herbs during all stages of pregnancy is toxic and they have to face more health risks. Such as Pimpinella anisum (anise), Cuminum cyminum (cumin), Cinnamomum verum (cinnamom tree), Mentha spicata (peppermint) and Chinese herbs. As some of these herbs, may cause abortion, toxicity and congenital malformations to the fetus [10-13]. Therefore, it is very important that the obstetrician, maternity nurses and other health care providers must ask the pregnant women about their health practices and any herbal medicines used by them to manage the discomforts. In this way, the wrong practices and strategies can be determined and appropriate education to correct practices can be given. They can provide consultation in alleviating, preventing and avoiding the minor discomforts of pregnancy and also they can inform the pregnant women about the risks of herbs and self-medication [13,14]. A lot of pregnant women do not know how to deal with the minor discomforts during pregnancy, which will lead to complications . The primigravida women require, teaching to promote their knowledge and practices to overcome these minor discomforts during their pregnancy . Few studies examined this context in knowledge and practices of Primigravida women regarding their minor discomforts of pregnancy. Previous studies were conducted in Asian countries, and they show that most of pregnant women need help and guidance during this period especially primigravida women . In this study, the aim is to assess the knowledge and practices of Primigravida women regarding minor discomforts of pregnancy. The purpose of this study is to examine the knowledge and practices of primigravida women about their minor discomforts during the pregnancy time. Which in turn, this study will draw the attention of hospitals and health care providers in obstetric department to provide the guidance, help and health education for the pregnant women especially to primigravida women. In addition, to prevent complications that might be happen from wrong practices used by the pregnant women to manage these discomforts. A descriptive design (cross sectional) was used in this study to answer the research questions. The study was conducted at Obstetrics and Gynecology Outpatient Department (antenatal clinic) of Maternity and Children Hospital in Dammam city (MCH), which is affiliated to the Ministry of Health (MOH) of Saudi Arabia. The rationale for selecting this setting is the high utilization of their services by pregnant women who are seeking for antenatal care. A total of eighty two primigravida women have attended the previously mentioned setting during the period from the beginning of March 2017 to the end of April 2017, and they also met the inclusion criteria. • Primigravida women who attended the antenatal clinics. • Antenatal women with normal pregnancy. • Antenatal women who are not willing to participate. • Antenatal women with chronic medical diseases. • Antenatal women with obstetrical complications, such as: antepartum hemorrhage, pregnancy induced hypertension, hyperemesis gravidaruim, multiple gestations and gestational diabetes mellitus. Socio-demographic characteristics about primigravida women (age, education, occupation, residence and gestational age in weeks). Probe (yes/no-questions) the pertinent to assess their level of knowledge on minor discomforts during pregnancy among the primigravida women. Probe the pertinent by using open ended questions to assess the practice reports among the primigravida women to overcome the pregnancy minor discomforts. A structured interview questionnaire sheet was developed by the researcher for the purpose of this study. The pilot study was conducted among 10 women, who met the inclusion criteria to ascertain the applicability and validity of the tools. Once the pilot study has done, the necessary modifications were made on the structured interview questionnaire sheet, and primigravida women in the pilot study were not included in the total sample. The researcher explained to every woman individually (who has the inclusion criteria) about the aim and the procedure of this study, and then written informed consent was obtained from the participant. The primigravida women were assured about anonymity and confidentiality of information to ensure honest response. The structured interview questionnaire sheet was instructed and being filled by the researcher. Subjects with less than 5 points=Poor. Less than 50 points=Poor practice. 50 to 100 points=Moderate Practice. More than 100 points=Good Practice. All categorical data were represented by frequency with percentage and continuous data were presented by mean with standard deviation. Significant difference among the demographic variables related to the total knowledge score and practice score were tested by using independent t-test and ANOVA test. Linear regression analysis was used to test the significant difference between the total knowledge score and demographic variables. Also scatter diagram was used to test the correlation between the knowledge and practice level. All the analysis was performed by using Statistical Package for the Social Sciences (SPSS) version 21.0 and p value less than 0.05 was considered as statistically significant. There are 96 women were identified for this study, and 14 women refused to participate. Therefore this study was carried out from 82 women. The data consists of 82 subjects whose demographic information (Table 1) illustrates that 79.2% of them fall in the age group between 20 to 30 and 9.8% of them fall below the age of 20. The education level of the primigravida women indicates that 46.3% were done university education, 36.6% were with high school education and only 1.2% of them as a postgraduate degree holder. Also the table shows that 84.1% of the subjects were housewives. The subjects were on different stages of pregnancy where 43.9% of subjects are in the gestation period of 29-40 weeks, followed by 30.5% are in the gestation period of 15-28 weeks and 25.6% are in the gestation period of 0-14 weeks respectively. Classification of the subject’s income depicts that 59.8% of them are having the monthly income ranging from 5,000-10,000 rupees and 32.9% are having less than 5000 rupees. Almost 31.7% of the sources of information are getting from family member. Table 1: Description of socio-demographic data among mothers (n=82). Figure 1 illustrates the knowledge of women and their discomforts that they feel during the pregnancy period. 98.8% of the pregnant women reported fatigue, followed by 96% reported with urinary incontinence, 95.1% reported with nausea and vomiting, 89% reported with backache, etc. Out of the 20 variables epistaxis was reported as the lowest discomfort felt by the women. Figure 1: Percentage of woman’s knowledge on minor discomforts of during pregnancy. It was observed that the overall level of knowledge among primigravida was good with 59% of them were falling under this category, followed by 32% of them with excellent knowledge and 7% of them with average and 2% of them with poor knowledge, respectively (Figure 2). Figure 2: Overall level of knowledge among primigravida mothers. Table 2 explores the relationship between the mean knowledge score of mother with their demographic variables. The knowledge score of mothers with their demographic variables infers the statistical significance, except occupation and monthly income of mothers. It is observed that there was statistically significant relationship between the ages of mothers with their knowledge score, followed by education and gestation period. Table 2: Relationship between knowledge score of mother with demographic variables. It is also observed that the knowledge score was high among primigravida women with the age of 30 years and above (score 13.9), followed by University education (score 14), pregnant women who are in the working class (score 14), women with gestation period 15-28 weeks (score 13.7) and the monthly income of women between the range of 5000-10,000 rupees (score 13.5) respectively. Under the age category, less than 20 years old women has the less knowledge (p=0.038) where in the level of education category, university degree holders have higher knowledge as compared with other category (p=0.023). But, there was no significant difference among the occupation levels (p=0.597). Gravidae less than 14 weeks of gestation has less knowledge score and it’s significant (p=0.003) and there was no significant difference among the income levels (p=0.230). All independent variables such as age, education and the knowledge scores were tested for relationship by using linear regression analysis (Table 3). It shows that only the gestation period variable significantly affects the knowledge of primigravida women compare to other independent variables. To be precise, those women with less than 14 weeks of gestation period have significantly less knowledge score. Table 3: Multivariate analysis of knowledge related to demographic variables. The Table 4 illustrates mothers’ practices to relieve discomforts of pregnancy, which is also addressed in Figure 1. When compared to Figure 1, the table provides the prevailing practices followed under 20 domains. Table 4: Mothers’ practices to relieve discomforts of pregnancy. The legend in Figure 3 indicates that the score less than 50 as an indicator of poor practice, the score between 50-100 as an indicator of moderate practice and the score more than 100 is good practice. The figure illustrates that 43% has moderate practice, followed by 47% and 10%, respectively. Figure 3: Overall Practice level among primigravida women. Table 5 describes the relationship between score on the practices followed by the primigravida and their demographic characteristics were examined for statistical significance. This table infers that there is statistically significant relation between two demographic features and the practice score of primigravidae; the significant variables were education (P=0.023) and monthly income (P=0.009). Table 5: Practice score by demographic variables. 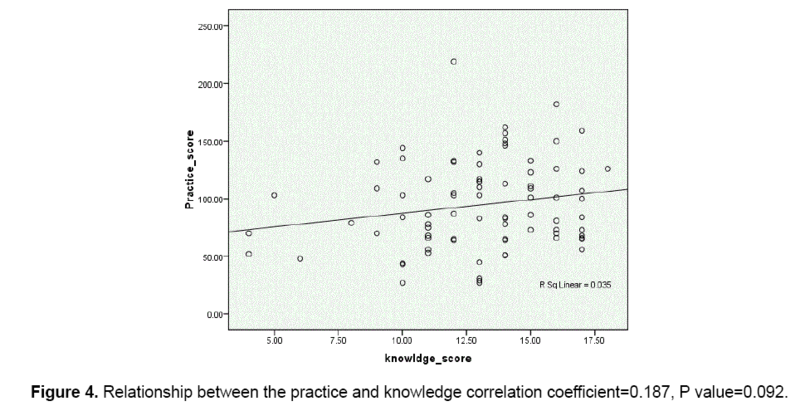 Figure 4 illustrates correlation coefficient between the knowledge and practice score, which was 0.187. This indicates that there is a positive correlation coefficient between the knowledge and practice, but it is not statistically significant (p=0.092). Figure 4: Relationship between the practice and knowledge correlation coefficient=0.187, P value=0.092. During the period of pregnancy, women will undergo by a lot of physical and hormonal changes but these changes are normal . These changes cause the minor discomforts during pregnancy such as; nausea, vomiting, constipation, back pain, varicosities and leg cramps. They are called minor because they are not life threatening. A lot of these discomforts may calm down in this pregnancy progress, but it causes inconvenience and stress to most of pregnant women . However, there are only a few studies are describing the relation between knowledge and practices of primigravida women regarding minor discomforts of pregnancy. The present study shows that the majority of the women (79.2%) were in the age group between 20-<30 and less than half of them were with university education (46.3%) and high school (36.6%), but irrespective of their higher education greater part of them were housewives (84.1%). Also less than half of them (43.9%) were in the 3rd trimester of pregnancy. This nearly agrees with the findings of a study conducted by Vincent  to assess the knowledge of Primigravida mothers regarding minor discomforts of pregnancy and its self-management using a structured questionnaire in India. These findings showed that 87% of the primigravida mothers were in the age group of 21-30 years, 73% of them were home maker, 53% were in the gestational age group of 29-40 weeks and 37% of the women had high school education. Moreover, a study conducted in India by Ramaiah  also revealed and the study found that 72% of the respondents belong to 21 to 31 years. In addition, the present study revealed that primigravida women were found to have good (48.59%) and excellent (26.32%) level of knowledge score regarding common minor discomforts during pregnancy. When we observed into the demographic characteristics, it puts light into the fact that the women below the age of 20 has less knowledge and the knowledge improves as age advances. This finding explained that the primigravida women learn more from their friends or family member’s experiences such as their older sisters. The source of information of some primigravida women (31.7%) in this study were from their family members, while only 8.5% of primigravida women derived their information from their health care provider. Also the level of knowledge of primigravida women is directly related with their educational level, and in relation to those women with university degree has higher level of knowledge score. This agrees with the findings of a study conducted by Vincent , which reported that there was a significant association among the knowledge of Primigravida mothers between their age and educational qualification. Also the present study shows that women in the 1st trimester of pregnancy have less knowledge score and the knowledge score gets increase when the gestational period increase. This finding educates the primigravida women to learn how to cope with the minor discomforts from their previous experiences in the early weeks of gestation. Furthermore, it may educate them to learn how to manage their minor discomforts during pregnancy from their health care providers during their follow up visits. Moreover, as regard to the overall level of measures practiced by the primigravida women to relief their discomforts during pregnancy. The present study shows that 39.47% of them were with good practice score while 35.43% of them were with moderate practice score and the rest of 8.10% were poor practice score respectively with a statistical significant relation among the practice score of primigravida women, the educational level and monthly income. However, those primigravida women with higher educational level were with high practice score. In addition, the current study indicates that there is a positive correlation between the primigravida women’s knowledge and practice scores, but it is not statistically significant (p=0.092). This may shows their ability to search and read more about the measures to relief discomforts during pregnancy. Similarly, according to Patil , if the mothers are educated, they can read the pregnancy care books related and this will help them to learn more about pregnancy and how to manage the minor ailments. Although, a statistically significant differences was observed with the majority of primigravida women (219.00 ± 0) with the monthly income of 15000 SR and above and their practice score, this may be because their ability to buy or provide themselves with things that they need during pregnancy such as healthy foods, compression stockings, comfortable pillows and hygiene materials. The overall level of knowledge among primigravida women is satisfactory and the related practices are also in moderate level, but the practices are not correlated with the level of knowledge. However, the current study recommends further research to investigate the unsafe practices related to minor discomforts during pregnancy and its effect on the mother and fetus. The limitation of this study was that data was not collected to explore whether the primigravida women received any sort of information related to antenatal education in this regard. If this data was considered, then the authors may be able to correlate this with their knowledge level and their practices. My heartfelt gratitude extended to nursing faculty and obstetricians of Maternity and Children Hospital in Dammam for their support, encouragement, facilitation and cooperation. I also would like to thank the participants who have willingly shared their precious time during the process of interviewing and thanks to them for their cooperation and positive response. Miller S and Thomson F. A book for midwives: Care for pregnancy, birth and Women’s health. 2 edn. California, USA: the Hesperian Foundation Berkeley. 2010. Yates S. Pregnancy and childbirth: A holistic approach to massage and bodywork. UK: Elsevier Health Sciences UK. 2010. Avery MD. Supporting a physiologic approach to pregnancy and birth: A practical guide. Somerset, US: Wiley-Blackwell. 2013. Whitehouse K. Common symptoms in pregnancy. Pinto D, et al. The knowledge on minor ailments of pregnancy and its management among antenatal mothers: A descriptive approach. Int J Recent Sci Res. 2014;5:1550-1553. Agampodi SB, et al. Minor ailments in pregnancy are not a minor concern for pregnant women: A morbidity assessment survey in rural Sri Lanka. PLoS One. 2013;8:1-6. Gartland D, et al. Women’s health in early pregnancy: Findings from an Australian nulliparous cohort study. Aust N Z J Obstetr Gynaecol. 2010;50:413-418. Latha P and Indira S. Effectiveness of IEC (Information, Education and Communication) package on knowledge regarding minor ailments of pregnancy and its management among antenatal mothers at selected hospital, Nellore, A.P. Int J Appl Res. 2016;2:593-596. Rosy M. A study to assess the knowledge and practice regarding minor disorders of pregnancy and the incidence among the antenatal mothers who 58 attending OPD at selected hospital, Kolar. Asian J Nurs Educ Res. 2014;4:284-287. Chuang C, et al. Herbal medicines used during the first trimester and major congenital malformations: An analysis of data from a pregnancy cohort study. Drug Saf. 2006;29:537-48. Amasha HA and Jarrah SS. The use of home remedies by pregnant mothers as a treatment of pregnancy related complaints: An exploratory study. Med J Cairo Univ. 2012;80:673-80. Kennedy DA, et al. Herbal medicine use in pregnancy: Results of a multinational study - ProQuest. BMC Complement Altern Med. 2013;13(355). Ali-Shtayeh MS, et al. Plants used during pregnancy, childbirth, postpartum and infant healthcare in Palestine - Complementary therapies in clinical practice. Complement Ther Clin Pract. 2017;21:84-93. Nazik E, et al. Incidence of pregnancy‐related discomforts and management approaches to relieve them among pregnant women. J Clin Nurs. 2013;23:1736-50. Sangeetha E, et al. A descriptive study to assess the level of knowledge on minor ailments in pregnancy among antenatal mothers in selected tertiary hospital, kanchipuram, Tamil Nadu. TJPRC J Nurs Pat Saf Care. 2015;1:1-6. Vincent S, et al. A study on knowledge of primi mothers on self-management of minor discomforts of pregnancy - Nitte University Journal of 59 Health Science, HighBeam Research. Nitte Univ J Health Sci. 2015;5:12-15. Patil N and Salunkhe J. Assessment of knowledge on minor ailments of pregnancy and home remedies. Int J Sci Res. 2015;4:674-677. Womens Health. Body changes and discomforts 2016;12-13. Ricci SS. Essentials of maternity, new-born and women’s health nursing. 3rd edn. Philadelphia: Lippincott Williams and Wilkins. 2007. Ramaiah P. Exploring the incidence and the effectiveness of structured teaching programme on minor disorders of pregnancy and its management among primigravida mothers in a selected rural areas in Dharmapuri Dt. Asian J Nurs Educ Res. 2015;5:118-120.